1920s; canvas, oil; 51×57.5; Hermitage. The work of the Italian abstractionist Giorgio Morandi fully reflects his world view and lifestyle. A graduate of the Boolon Academy of Art, where he later became a teacher. He led a modest reclusive life, his work caused admiration of a small circle of friends, and only after his death did the world come to the artist. 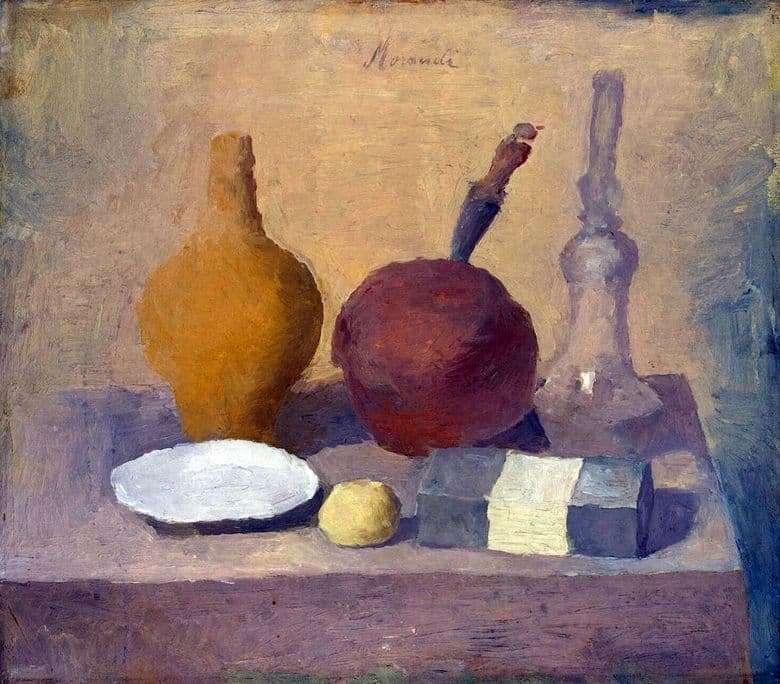 Focused more on what goes on inside than on the outside, Morandi always painted objects that had nothing to do with political squabbles, everyday reality. He did not seek to express himself through art, he liked to capture the beauty of the surrounding world. Therefore, landscapes of the surroundings of his native city and numerous composite still lifes predominate in his works. Depicting man-made objects, Morandi seeks to reflect their true essence, to look from an unexpected perspective, to tell a little more about them. On the canvas, presented in the Hermitage Museum in St. Petersburg, you can see three tall vessels of fancy shapes, a white plate, fruit and a box of black and white colors. Still life is made in warm yellowish-pink tones with the addition of gray and blue. It is noteworthy that the items on the table in two rows, as if melted in the air. Their forms are unclear and vague, the figure only denotes them on paper, but does not give them weight. They are airy, weightless. Still life Morandi appeals to the feelings and sensations of the viewer, involves in the process of creation, awakens imagination.